An early monastery was founded here by St Mochua-Cronan Mochua, a disciple of St Carthage of Lismore, in the 6th century. He later became the first Bishop of the See of Balla. The See eventually merged with that of Tuam. After viewing images of the tower and reading about the neglect of the graveyard I was not expecting a great deal from my visit to Balla. But on my arrival I was delighted to find the graveyard in excellent condition. The round tower turned out to be very interesting also. It stands 10 metres high and was well constructed using red and brown coursed sandstone. 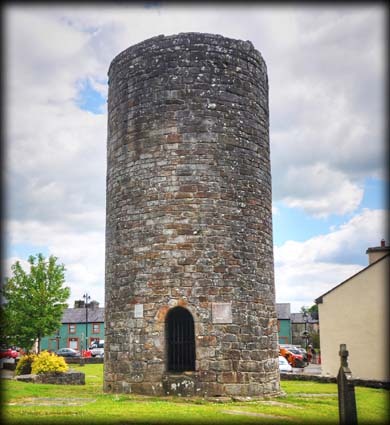 In his book on Irish Round Towers, Lalor describes it as a rogue tower. There are two doorways, the upper lintelled east facing doorway suggests an early date, but Lalor says the plans were altered during construction and give the impression of an early date. 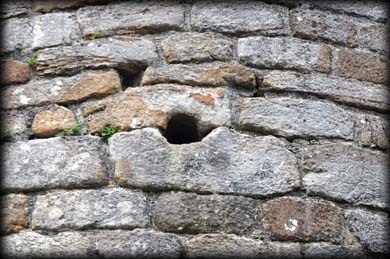 There is moulding on the lower jambs pointing to 12th century for construction. The arched north facing lower doorway is probably a late medieval insertion. There is a single small window in the southside of the tower, it looks like a gun loop. 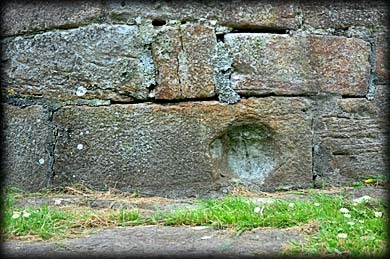 Pictured left is the lower north doorway, in the centre is the visible single offset and at the right is the original upper doorway. As I walked around the tower I spotted two large bullaun stones at the lower east and west of the drum. Situated: Easy. From Castlebar travel 13 kilometres southeast on the N60. 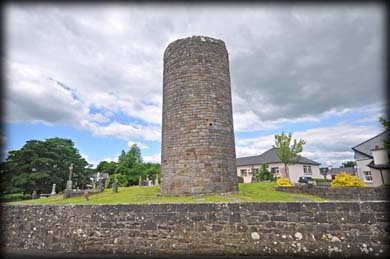 The Tower is located to the north of the village square behind the Community Centre. Discovery Map 31: M 2547 8454. Last visit June 2014. Door: Above ground 6.66 metres Type: lintelled. Windows: One odd looking window.